Many people are unhappy with the way that their teeth look. There are now available many techniques and materials that can improve the appearance of your teeth. Bonding, a new way of using plastic material to correct dental problems, is one of the most important of these techniques. There are many cases that bonding can be used to treat teeth. Some of these cases include: badly fractured or chipped teeth; and widely spaced, malformed, or badly stained teeth (from the use of certain antibiotics such as tetracycline during tooth development. To begin with, a mild etching solution is applied to the enamel of the tooth or teeth being treated. The etching solution is used to cause the tooth enamel to become slightly rough, which in turn will allow other materials to bond to the tooth. Next, the tooth is painted with a liquid plastic material called resin. The resin adheres to the etched surface, where it is held firmly. At this point, the dentist may choose to either apply a composite resin, or bond acrylic or porcelain veneers to the teeth depending on the problem being treated. The composite resin is a thicker plastic material that is used to form, rebuild, or replace parts of a tooth. After the composite resin has been shaped, it is hardened by either a chemical process or by exposure to a special light. The surface of the composite resin will then be polished. The acrylic or porcelain veneers use the same resin materials as the bonding agent and are bonded to the front surfaces of the teeth. There are many advantages to bonding. Bonding can improve the appearance of the teeth with little or no drilling or anesthesia. Teeth that have been bonded generally require a shorter treatment period and may cost less than crowns. Bonding also has some limitations. Bonding is used primarily as a way to improve the appearance of the front teeth. Teeth that have been bonded are not strong enough to withstand the pressure that is exerted on the back teeth or any of the chewing surfaces of the teeth. Bonded teeth typically have an average life of three to five years which is somewhat shorter than the average life of a crown. Composite resin materials also have a tendency to stain rather easily, especially if the person smokes, drinks coffee or tea, or eats certain types of foods. 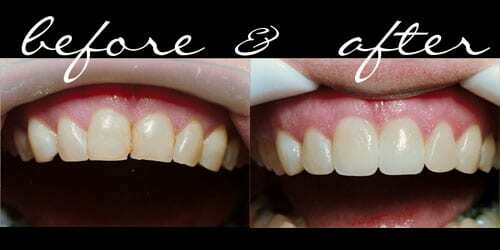 Veneers offer a more permanent solution to bonding. 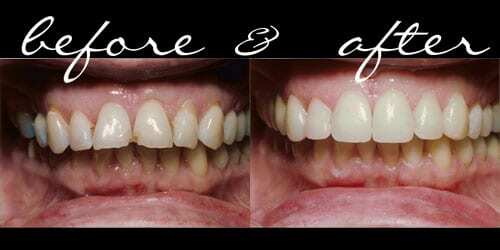 Veneers allow for minimal removal of tooth structure. With veneers teeth can be made to the ideal shape, size, and color. There are several techniques that can used to improve the appearance of your teeth. A dentist will be able to recommend a particular treatment after a thorough examination of your teeth and considering your individual needs. If you are unhappy with the way that your teeth look, check with a dentist about the many different techniques that can be used in cosmetic dentistry. Many people, just like you, have taken this step, and have happier, more beautiful smiles to prove it.